The conversation in the country is changing, and it is all happening online as Saudis leverage social to speak freely. 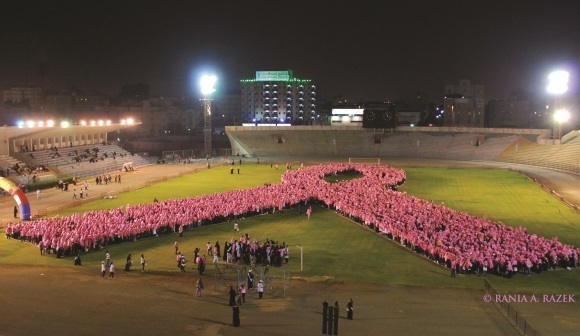 10KSA aims to raise awareness of breast cancer among Saudi women. In March, as more than 33,000 people milled around Austin, Texas, for South by Southwest Interactive, one campaign stood out among the startups, apps, and brands vying for attention. Called 10KSA, the initiative was launched by Saudi Arabia’s Princess Reema Bint Bandar Al-Saud and the Zahra Breast Cancer Association with the goal of raising breast cancer awareness. In her keynote, Princess Reema asked attendees to take their photo in front of a set of neon pink wings and share it on social media with the hashtag #10KSA. At first glance, SXSW may have seemed an unusual place to launch a campaign aimed at Saudi women, but Sanaz Alesafar, project lead for 10KSA, says organizers saw the venue as a chance to promote solidarity among women globally. And Austin, with its techies and social media addicts, mirrors the connectedness of Saudi Arabia. The country has one of the most active social media markets in the world. Saudi Arabia accounts for 40% of Twitter users in the Arab region, with 5.4 million users tweeting more than 210 million tweets per month, according to Jeddah-based social media agency The Social Clinic. Ninety-three percent of Saudi Internet users are on Facebook, and 96% watch videos on YouTube. "Saudi Arabia is one of the best markets to really engage society through social platforms," says Mamoon Sbeih, MD of the Arab region for APCO Worldwide. This is partly due to the country’s demographics – more than half the population is under the age of 35. " It’s the number one way young people are engaging with each other and with corporations and government," he adds. Social media has taken root because it provides platforms for freer expression, sources say. Traditional media is tightly controlled in Saudi Arabia, and criticism of the government, royal family, or Islam is not usually tolerated. Even on social media, the Saudi government has attempted to regulate comms, especially when it comes to politics and religion. For example, writer Turki al-Hamad was jailed for six months in 2012 for tweets deemed critical of Islam. Out of caution, many Saudi social users hide identifying details on their accounts, such as full names. However, conversation on social media is generally more open, and people discuss topics they might otherwise be careful or shy to bring up offline, say sources. "Taboo topics offline are heavily talked about on social media," says Diya Murra, account director at Middle Eastern social media agency The Online Project. 10KSA is an example of an organization using digital channels to tackle an issue that can be difficult to discuss candidly offline. Breast cancer is the leading cause of cancer death for Saudi women aged 20-59, often going undetected until a late stage, but awareness is lower because of "cultural stigmas attached to health," says Alesafar. "We’re talking about a private body part in a public way," she says. "In the Middle East, that’s an interesting conversation to navigate." 10KSA is spreading the word through a short film, local activations, and social efforts. The campaign will culminate in an event in Riyadh in October, which will bring together 10,000 Saudi women for health education, mammograms, spa and fitness activities, and entertainment. Saudi brands are taking social media more seriously from a commercial point of view, as well. Bilal Hallab, founder and GM of The Social Clinic, says clients now devote about 5% to 8% of their annual marketing budgets to social media, with some companies increasing the social media share to as high as 40% or 50%. "When we first started [the agency] in 2010, no one took us seriously," Hallab recalls. "We had a lot of problems educating people on how to use it." He notes that one client, who he declines to name, spent about $40,000 of its marketing budget in 2011 on social efforts. That number increased tenfold in 2015 to $400,000. Hallab predicts in the near future, brands will spend about 80% of their marketing funds on social and digital media. "Social media has made the culture less stiff and a bit friendlier," he adds. "It has broken many boundaries and will continue to do that." Saudi residents watch more hours of YouTube content per capita than anywhere else in the world. The most popular type of content on the platform is comedy, says The Online Project’s Diya Murra. "If you ever visit Saudi Arabia, you’ll find people are very funny and sarcastic," he says. An example of a popular YouTube comedian is Omar Hussein, who also helped introduce Saudis to Snapchat. "A comedian [Hussein] started using Snapchat and that’s why it became a trendy platform to use," Murra says. "Even brands such as banks are looking into using it – that’s how big the platform has become in the last few months."